A film depicting a young girl Nina who appears to develop a mental health psychosis, as a result of the intense stress she puts her self under as she prepares for the dual leading role in the ballet Swan Lake. Way, way back in the late seventies my mum took me to ballet lessons as a wee girl. Once. Possibly thinking this would help me tell the difference between left and right and become more coordinated. Sadly it was not to be, as after the first lesson I was told I was only there for the sweetie at the end. I still can’t tell left from right despite a wedding ring on my finger, fall over far too much and have a sweet tooth. Soon after this, I saw ballet yearly at the theatre as my birthday treat and remember seeing Coppelia, The Nutcracker and La Fille mal gardee. And to be honest, I can only remember understanding the plot of The Nutcracker, making up my own plots for the others. Which bode me well for the future in various trips that I’ve attended the cinema or theatre in my first few years here in Finland when I worked in kindergarten and knew very little Finnish. So fastforward a few decades and I noticed the En Pointe The Ballet Blogathon run by Christina Wehner and Love Letters to Old Hollywood. My first choice for a ballet film I confess was White Knights (1985) This was recommended to me by Darlin’ Husband and I remembered had that lovely 1985 soundtrack title song, Separate Lives, a Phil Collins duet with Marilyn Martin. And since then it’s always been one to watch on my 1980s list because I’m so intrigued to see more after rewatching this song’s accompanying video. Sadly it was not on my film streaming service or in my DVD collection. So instead I’m picking this film, which is Black Swan (2010) a film on both. So armed with pen and paper I rewatched this Oscar Winning film. For those not familiar with the story of Swan Lake, an in-film explanation is given. The gist is a girl is turned into a White Swan, with only true love breaking this curse and her prince is seduced by her more evil twin the Black Swan. However, on discovering this the girl kills herself and she gets her freedom from this curse as she dies. It stars Natalie Portman as Nina, a professional ballet dancer. Nina’s dream as the lead White Swan in Swan Lake, is hauntingly shown as the film starts. Nina is a loner, who lives with her ex-ballet dancer mother, Erica Sayers (Barbara Hershey) in New York. Her mother Erica gave up her own dancing once she fell pregnant with Nina. After breakfast, of half a grapefruit, Nina notes a scratch on her back. She then spots a woman in black on the way to the train to her ballet training. Intrigued, Nina follows her to the stage door. Later as Nina attends the ballet coaching in this same building, the woman in black is revealed to be Lily (Mina Kunis). Thomas Leroy (Vincent Cassel), a choreographer tells Nina and Liiy’s dance class he is looking for a new Swan Queen for his new Swan Lake production. This he says as he is retiring Beth (Winona Ryder) his usual leading dancer. Beth is unhappy at this news, and is angry with him. Nina steals a lipstick from Beth. On auditioning, Nina is disappointed not to get the lead role after a perfect and flawless performance as the White Swan but her Black Swan interpretation is criticised publicly. On the way home from the audition, she sees a woman who looks like her but wearing black. Both Nina and her mother are upset when she does not get the coveted role. With Erica concerned about the pressure Nina is putting herself under. The next day with her hair down and putting on Beth’s lipstick, Nina asks Leroy for feedback and is told that she was not able to perform as well as the Black Swan. Leroy stating she presented a non-seductive virginal, rigid portrayal more synonymous with the White Swan. This also as she failed to lose herself and let herself go in the darker side of this role from her usual perfect poise. Leroy kisses her violently, and Nina bites him to break away. After Nina congratulates the lead in this production, she is shocked to learn Leroy has changed his mind giving her the lead role. It is interesting how the characters in the movie have Swan Lake counterparts. Nina wears in white and pastel colours at the beginning of the movie as the White Swan and as she immerses her self in the Black Swan role her clothes get darker in colour. As the intensity of her psychosis is felt, Nina later imagines black feathers and with an eerie click believes she has swans legs. in a chilling scene. Both symptoms showing how she is gripped with her beliefs on her becoming the Black Swan. Kunis is always seen in mainly black clothes and appears more sociable, less uptight, friendly and relaxed. This is also seen as Portman’s Nina appearing uptight with her hair in a perfect bun, until her darker side comes out with her hair more loose, reminiscent of Joan Wilder in Romancing the Stone (1984). The nature of Nina’s mental health problem is widely debated online. From my understanding it shows a depiction of a young girl losing her grip on reality leading to her developing what appears to be a psychotic episode. This while she prepares for the role of her ballet career as the lead in Swan Lake. However, her psychosis is exacerbated when she takes the ecstasy and combined with the pressure and stress in preparation for the role of the Black Swan. This stress from herself and others. With regards to a possible eating disorder also suggested by writers. I was unclear if in Nina’s perfectionist traits at the start of the film, this was part of her strict diet as a dancer. With the need to keep to this becoming more obsessional in nature as the film continued, than a recognised eating disorder. Many questions on the character’s motives can also be debated… It is apparent Nina’s mother is possibly over protective, is she over concerned at her daughter when she sees the scratches on her back. Or overly protective, when she goes out with Lily for the night – or is she controlling and trying to and infantilise her with her cuddly toys in Nina’s girly pink room. Or is it a matter of Nina’s choice. Erica also appears to project her unreached dreams onto Nina, but these dreams are more realistic. As she appears to be less controlling after seeing the intense pressure her daughter develops in herself. It is then Erica that is more concerned about her daughter’s wellbeing. Lily is a source of doubt on whether she is telling the truth or lying, leading to you unsure of Nina’s reality. Cassel is a chilling choreographer and comes over as sinister and quite lecherous and manipulative at times. However it is painfully obvious that Cassel preys on his dancers by pushing then by bullying them and taunting them. Is he is a man very much in control, notice how he publicly dismisses Beth and taunts Nina on her lack of experience with men. Or is this a technique he uses – cruelly – to get the best from his dancers. On a lighter note, Portman’s ballet dancing is fantastic and memorising to watch, and she deserved the Best Actress Oscar easily. This for this almost Nina like determination and dedication to master both roles perfectly. Mention should also go to Kunis for her ballet and support that she contributed in this film. Both actresses are physically perfect in their roles, as is Winona Ryder as all are wee and petite. This makes their portrayals in their characters more believable due to their size. Taller actresses would make it less credible. But ignore those who tell you to imagine Kunis as her Meg Griffin role in Family Guy. It does distract you from the movie.. for a wee while anyway. 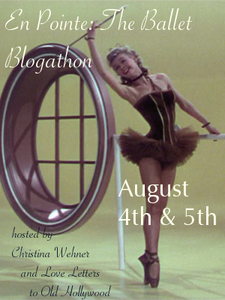 This post was added to the En Pointe The Ballet Blogathon run by Christina Wehner and Love Letters to Old Hollywood. Other reviews with this cast include Barbara Hershey in Beaches and With Six You Get Egg Roll (her debut), Natalie Portman in Thor. Mars Attacks and Your Highness and Mila Kunis in Family Guy and Ted. Thanks Emma x Got a few reviews with Jeff Goldblum now – The Fly and Thor Ragnarok, hope you enjoy them. What a review! Wow – that blew me away! I loved that film; nice to be reminded of it. Thank you! Thanks so much, for your lovely comments. No problem, if there is anything else you would like to see reviewed hit the request reviews button. As someone who only differentiated left from right AFTER having a college degree, I high five you. And, oh, I never imagined myself dancing ballet, so I’d probably go to a class only for the candy. Your review of Black Swan was very good. Now I see a parallel between Nina’s mom and Isabelle Huppert’s mom in The Piano Teacher – BTW, Isabelle’s character is called Erika in the film, just like Nina’s mom. This film is interesting and well-done, but it is also one pack of unpardonable, misleading crap. Portman’s Oscar is a joke since her double, the great Sarah Lane, did all the work for her, and Aronofsky essentially lifted off “Perfect Blue”‘s idea, premise and characters and had his “Black Swan” as a result. Not heard of that film, did think it got a wee bit silly in the second half. Thanks for contributing to our blogathon! “Queen Amidala meets her dark side.” That’s an awesome tag for this film! I have not seen it, but it sounds almost like ballet meets horror a little? I don’t often associate horror with ballet, but when I think of it, it actually makes sense. Ballet has always been rather on the fantastic/fantasy side of things and there is definitely a dark side to fantasy. Thanks so much for joining and for your intriguing review of this film! Thanks for having me Christine, fantastic choice of blogathon x You summed it up wonderfully! I love this movie. It’s so immersive, strange and spellbinding. Plus, Natalie Portman committed her all to her performance. It is a great movie, and it is pretty immersive as you say, I do love a good movie that you get so into you feel you are almost there. It completely pulls you into the feverish world. Yes, it must be punishing on the body and mind. Great review on a great movie!